advancedaccess is a secure online service, hosted and provided free by advancedlife to all our customers. advancedaccess puts all our images, products and services at the fingertips of any or all of your staff. advancedaccess gives you access to data and images to assist with school administration, including live access to student, school and product images, templates for useful documents, details relating to your advancedlife account, the ability to order and reorder products and print, a vast image archive that can also store your own images, and other useful online services. advancedaccess is making access easy! Access for multiple nominated users, 24/7 – everything you need, when you need it! Free secure hosting – save your server space! Where is advancedaccess hosted and will it use my server space? advancedaccess is hosted securely by advancedlife and does not use your server space or require access to your network, systems or servers. Why does the registered user invite process require a Public IP Address? During development of advancedaccess we discussed security methodology, user access and permissions/limitation protocols with many of our schools to help shape this service. One of the key concerns was to ensure the service could reliably limit user access to within the school. Users in most cases do not require access to the functionality when they are not on the school grounds and using school computer equipment. By the invite process recording the registered user’s Public IP address, it ensures that a user would not be able to login in to the system from any other domain unless the administrator has granted them permission to do so by specifically identifying their remote access IP. Such permissions and exceptions are all easily managed by the administrator via the user console. We confirm your Public IP address in order to provide individual schools with a robust security method of restricting user logins to advancedaccess, so it can only be used by authorised users at a particular location/Public IP address. We will not be attempting to connect to anyone’s Public IP address or servers and do not require any access to your network. We considered when developing advancedaccess that there may be many types of user per school (Principal, Teachers, IT, potentially external yearbook designers) and wanted to provide a way to restrict user access to specific Public IP’s. For example, this security setting can allow the school to ensure that teachers only access advancedaccess when on campus, whilst giving an external yearbook designer ‘Remote’ access for a specified period only. The administrator chosen by the school determines who has access to what and for how long. The advancedaccess user console enables the nominated administrator to manage all invites, registered users, access rights and whether any registered users require access offsite of the school, such as an external magazine or yearbook creator. What's being setup to give me advancedaccess in my school? We will initially set you up with an administrator login for the advancedaccess online service. The school selects an administrator for advancedaccess with the understanding that the administrator has full control to determine who within the school will have secure access to all or part of the free online service hosted externally by advancedlife. Does advancedaccess require installation or access to the school’s systems or network? advancedaccess does not require any interaction with your internal network or servers. Your internet connection will be used to view our website and download whatever content you require (student group and portrait images, admin DVD assets, promotional images, and more), but this is the full extent of the interaction. You choose what you want from us and select it to download (sent either as pdfs or in your school’s selected administration system format). You then decide how to use that downloaded material; we simply provide you with easy live access to it. It does not download automatically to any location at your school or interact with any of your systems. Whatever is requested by the school from advancedaccess is generated on advancedlife’s servers and delivered back to you online as a downloadable pdf. What approvals from DET do we have for the use this system? None. It is hosted externally and does not require the use of or access to any DET systems, programs or servers. What interaction with our DET network is being requested? None. It is a website with school-managed accessibility, that sends requests to our system to provide pdfs and downloads that are then taken across by the user to your system. It does not communicate directly with any DET administration system nor require any access beyond standard internet access. We are not accessing the school’s systems, we are granting the school access to ours, as any external website operates. Whatever is requested by the school from advancedaccess is generated on advancedlife’s servers and delivered back to you online as a downloadable pdf or as a download in your administration system format. Have you ever had any data breaches or been hacked? What are your hacking and breach policies? advancedlife has been actively operating online since 2009 and we have never experienced any data breaches or security incidents across our online services. We are committed to student protection and security. We pride ourselves on our innovative online services for families and schools, which means that security is a priority across all of our platforms and we ensure that our data and our customers’ data is protected at all costs. It’s one of the key reasons that all our online services have been developed by our own in-house IT development team. Our SQL and all our online services are hosted internally at our Head Office in Sydney, behind an enterprise-grade firewall that allows us to monitor them continuously, 24 hours a day. Our storage infrastructure is on-site in a private data room. We host our advancedorder, advancedyou and advancedaccess sites within this data room to ensure we can have the firewall configured to our exacting standards. We also have a premium SSL, to ensure all information/transactions are private and cannot be intercepted. advancedaccess is hosted internally and does not require any interaction with external networks, including those at a school. It has been developed with the most robust methods of security and user permissions. The initial login provided to a single identified administrator on advancedaccess also means that the school has full control to determine who has access to the site within the school, and those permissions can be added or deleted by the administrator. The school will have full control of who can and cannot access the site, from where and for how long. The administrator has the ability to extend or limit the functional extent of those permissions and the period in which a user has access. Further to these permission within the school’s control, we have also developed the ability for the school to lock down user login to a specific public IP address (or many IP addresses, but only if the school desires), to ensure only the invited users can ever access the service. Our IT development team spend considerable time and resources to stay abreast of any and all changes in technology that may affect any aspect of our storage, infrastructure, connectivity or online offerings. With no record of any form of breach or incident, we pride ourselves on delivering consistently robust and secure online services. Please be assured that if at any point we identify an eligible data breach we will follow the guidelines set out by the Notifiable Data Breach Scheme under Part IIIC of the Privacy Act 1988 and the school would immediately be advised about the extent of the breach, how it has been contained, and any further recommended resolution. Who has access to this website? Your school nominates an administrator to have full access to all the functions of the service and they then have full control to determine who will be invited to use it, what they can access, from where and for how long. The school administrator can add registered users, remove registered users, restrict functionality of registered users, view user activity, enable remote users (or block them), and provide a specific date limited period of access to invited users. How do I invite a new user? What if they do not work on the school premises? Login to advancedaccess via the ‘Quick Links’ panel on the home page and click on ‘User Management’. On the next page, you will see ‘User Accounts’, ‘Invites’ and ‘IP Address’. Click on ‘Invites’ and then ‘Add New User’. In the box that appears, enter the email address of the contact you are inviting to use advancedaccess. If this person will be an ‘Administrator’ of advancedaccess then click ‘Admin’ as the permission level and this will be applied. If they are not to be an administrator, then check/select from the list: Students, Groups, Events, Promo, Artwork, DVDs, ID Cards, Proofs, Reports and Remote, and select the functionality to which you want the new user to have access. Click ‘Next’ and you will get a confirmation. The invited use will then need to check their email account and follow the ‘Register My Account Now’ link and follow the setup instructions. IMPORTANT: If you check the ‘remote’ option, the user will be able to log on to advancedaccess from IP addresses other than your school’s IP address, e.g. from a home computer. Remote access permits users outside the school to log on and utilise the advancedaccess site from a computer that is not located at your school and therefore has a different IP address. If the Remote option is ticked (see highlighted below), any Public IP will be allowed for that user, so they can sign into advancedaccess remotely, i.e. an authorised user can login not just at school, but also on their home computer using their secure credentials. If the Remote Option is un-ticked, then the User’s Public IP must match the IP addresses entered in the ‘IP Address’ table i.e. they can only login with their secure credentials from a computer at your school. The purpose of this option is to provide an additional layer of security, if desired, so that your school can ensure staff can only login to advancedaccess while physically present on your school grounds but give you the flexibility to invite users from outside the school. This use might be limited for a specific time period, for example, just a few months while they work on your yearbook or on another special project for the school that requires access to your images and data. You might also choose to tick this option if you want a trusted member of staff to be able to access advancedaccess from their home computer. An IP or Internet Protocol address is a code assigned to each device connected to a computer network that uses the Internet Protocol for communication. Your IP address serves to identify your network and your location. A Public IP is assigned to your network by your Internet Service Provider and serves to identify the connection and your location amongst the Pubic Internet. Your school will most probably have a static Public IP address. A Private IP is assigned to all your devices on the internal network and is usually dynamic. We only require you to note your Public IP address, so we can identify if a user is logging in from the school network or outside the school. What restrictions can I place on a user’s access? Your school’s nominated advancedaccess administrator/s can decide who can be a user and select the functionality each user has access to, including: Students, Groups, Events, Promo, Artwork, DVDs, ID Cards, Proofs, Reports. Besides determining what users can see and do on advancedaccess, the administrator can also choose whether a user has ‘Remote’ access from a location outside your school, and for how long a user can have access. Your administrator can monitor every user and their activity within the system. Why do we ask for each user’s mobile number when they register as an advancedaccess user? We ask for your mobile number so that if you forget your password or username, and it is necessary for us to verify your identity, we can text you a security code and confirm your identity. Please make sure not to add any spaces between the numbers. We will not use your mobile number for any other purpose. Can I set up an account without providing a mobile number? If you do not have a mobile phone or you are unwilling to add your number, you can enter a dummy number such as 0000000000 (make sure not to add any spaces between the numbers). As long as the number has 10 digits the advancedaccess account can still be set up. Please note: Giving a dummy mobile number will make it more difficult for you to retrieve your user login information, should that be necessary. You can visit www.advancedlife.com.au and click on the advancedaccess logo at the top left of the screen and it will take you directly to the advancedaccess login page, where you can enter your login credentials. Once you have logged into advancedaccess, click the star in the search bar to save the current page as a bookmark or you can press Ctrl+D on your keyboard. A dialog box will appear - click Done. The bookmarked page will be saved to the Bookmarks bar. How do I download an individual student image? The ‘Students’ page is the place to find and download individual student images at a high resolution. Select the image you need, tick the box under the image and click ‘download selected’. The image will download to the download box at the lower left of your advancedaccess console. Once the image has downloaded, click the ‘down arrow’ on the image in the box at lower left and save the download to your computer. How do I download a group image? The ‘Group’ page is the place to find and download group images at a high resolution. How do I download images in my administration system format? The ‘DVD’s’ page is the place to download images formatted for use with your administration system. Select the year, scope, ID Field and the system format you need and then click ‘download selected’. The selection will download to the download box at the lower left of your advancedaccess console. Once the selection has downloaded, click the ‘down arrow’ on the selection in the box at lower left and save the download to your computer. IMPORTANT: advancedaccess does not download to, or automatically access any school administration system. It provides you with your selected images in a format that will be compatible with your administration system. If we do not list your current administration system in the options provided, please contact us and we will send you your selection in the format you require. How do I find and download high-res images? When will I get low-res images? Whenever you request an image from advancedaccess, it will download as a high-res file, other than images downloaded for administrative purposes in your school’s selected administration format. Images for admin systems are always downloaded as low-res files, as this is the size most administration systems require. For all other images, you can easily access the high-res files. ID Card Templates with images – visit the ID Card page and select the year, school year and template and then click ‘submit’. Can I use the high-res promotional images for other things? You can use any of the images you download for internal school publications, yearbooks and other purposes. The images cannot be reproduced for commercial purposes or distributed to parents. If you’re unsure, please contact us at advancedaccess@advancedlife.com.au and we will be happy to clarify any questions about how you can use images downloaded from advancedaccess. How do I add or delete a student or staff image or change their details? Any edits you make within advancedaccess to Student/Staff Data (first name, last name, date of birth, class, etc) will only be applied within the advancedaccess environment for your purposes and are not reflected in our database used to create the various products we build for your school. 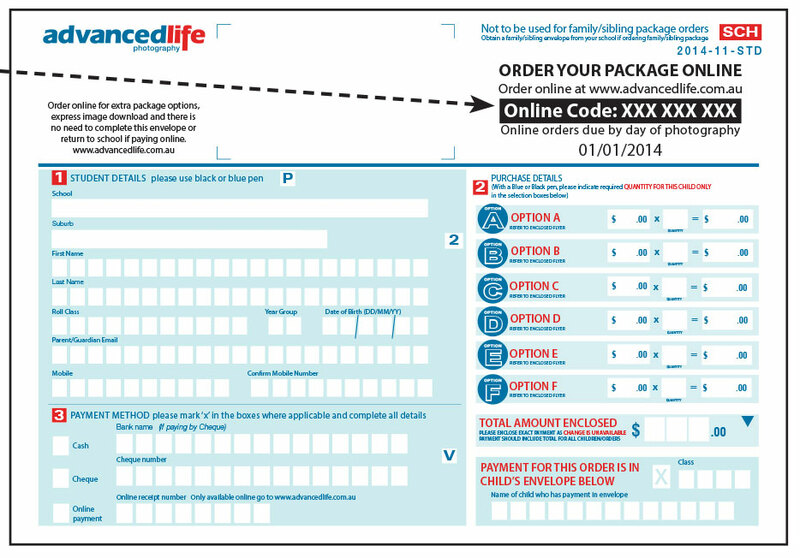 Any changes that need to be reproduced on the photo packs or reorders of those packs must be submitted to your advancedlife CSO or reflected in the data set you send us prior to photo day, that is used to create your IDs and photo products. However, any edits or changes you make to your advancedaccess will be applicable to all advancedaccess transactions – so whatever you do for your school within advancedaccess will be reflected in anything you download from advancedaccess, whether that is an Admin DVD download, high-res images from the yearbook/magazine page, or when you place your online ID card orders. Visit the ID Cards page, select the image of the student that you want to order an ID Card for, and click ‘Add selected order to list’, then click ‘submit’. An order has been placed and the ID Card and invoice will be sent to your school or automatically deducted from your account (this account function will soon be available in advancedaccess). Can I upload my own images to advancedaccess? Yes. You can upload individual staff and student portraits through the ‘Students’ page. If you would like to add images from events at your school such as swimming carnivals, fetes, concerts, etc, you can send us these images and we will upload them for you. If we are a split campus school or Junior / Senior school, can we link our advancedaccess accounts? Can we spend our commission on things we need from you and see our account? We are currently developing a new function within advancedaccess that will give you the ability to view your account with us and decide how you would like to use the commission you receive from the sale of photo packages. You might choose to use it to pay for replacement ID cards, put towards the cost of a yearbook, or to cover the cost of some promotional print or design work you might need. For amounts under $100, rather than receiving invoices from us, we can easily deduct these small amounts from your account automatically; otherwise, you will receive a hard copy invoice as usual for all amounts greater than $100. Plus, you will always have the option to have the commission paid to you in part or in full, if you wish. You can send us this request directly from the account page or discuss it with your Client Manager. I need images with specific data associated with them – first name, last name, class, etc – how do I do that? You can get these images by visiting the ‘DVDs’ page and choosing the ‘Yearbook/Magazine or Publication’ tab and selecting the size of the images you would like to download and the data you would like to associate with the downloaded images. How do I get a quote for a print product or a reorder of something I have bought from you before? Simply click on ‘Print’ in the top menu of our site for instant online quotes, quick custom quotes and online orders. You can also contact our Print & Design team via print@advancedlife.com.au who will help you with any questions you might have or will do all they can to better or match any quote you have from another company. We also offer free design on most of our print products! I’m creating a yearbook – how can advancedaccess help? It’s easy to download all kinds of assets to help you with yearbook compilation and design. advancedaccess offers high resolution portrait images with the data you need, logos, group images with artwork and separate names formatted to make life easy for your yearbook editor. You can also access and download promo images from advancedaccess and we’ll soon offer yearbook design templates. Plus, did you know advancedlife can print and design yearbooks for you? If you’re looking for an easy and cost-effective solution to creating a yearbook, contact us to find out how we make yearbooks easy. Very soon we will offer you the ability to easily proof your group images online. Images that require proofing will be added to your school’s advancedaccess site. You can then have your team view and proof the images live, making your corrections and notes directly on the page. If you don’t choose to proof images using the online system, you will also be able to download proofs as pdfs and send them to your staff to check, or you can print hard copy proofs and distribute them to whoever needs to check them. Can I update our school details on my advancedaccess home page? School detail fields cannot be edited on advancedaccess. If anything is incorrect or needs to be updated, just let your CSO know and we’ll correct it straight away, so it appears on our systems as well as for you in advancedaccess. What new functions are coming soon to advancedaccess? We’re constantly updating the functions and usability of advancedaccess and we’ll be letting you know as new functions come online. However, if there’s something you’d like to see that’s not available, or if you have any idea about how we can make advancedaccess even better, we’d love to hear it! Just email us at: advancedaccess@advancedlife.com.au or let your Client Manager or CSO know.